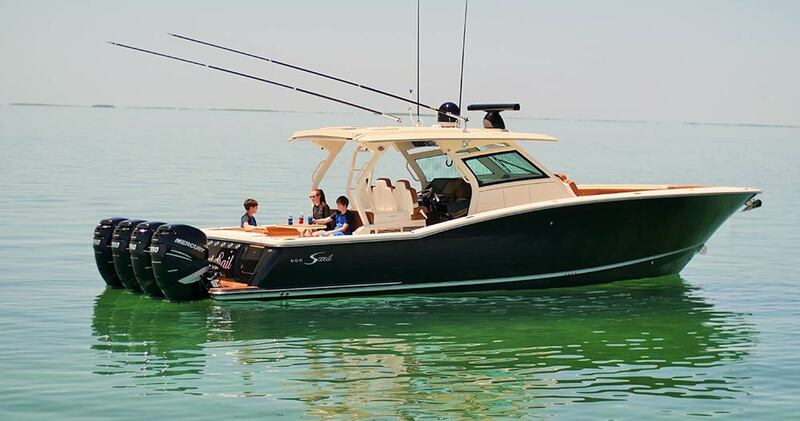 Scout’s new 420 LXF is both cutting-edge fishing machine and luxurious cruiser. 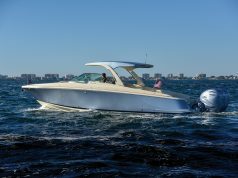 It’s easy to imagine that Steve Potts—founder and president of Scout Boats—felt a deep sense of satisfaction when the new 420 LXF (luxury sport fish) center console started hitting the water for new customers earlier this year. 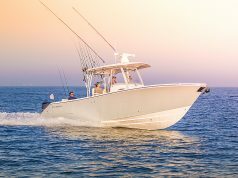 The 420 LXF took more than two years of development—including nine months of on-the-water testing—before the powerful center console was launched. 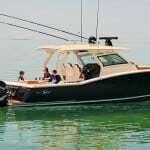 As the largest boat in the Scout line, the 420 LXF carries the flagship label and with that, high expectations. Why the long wait? 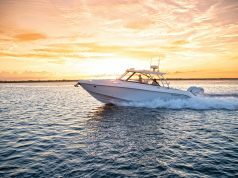 With a waterline length of 42′ 1″ and twin steps built into the running surface, determining exactly how to configure the 19,100-pound boat and its many features was a big issue. Consultants included speed merchant and racing legend Reggie Fountain, who helped with the bottom design. 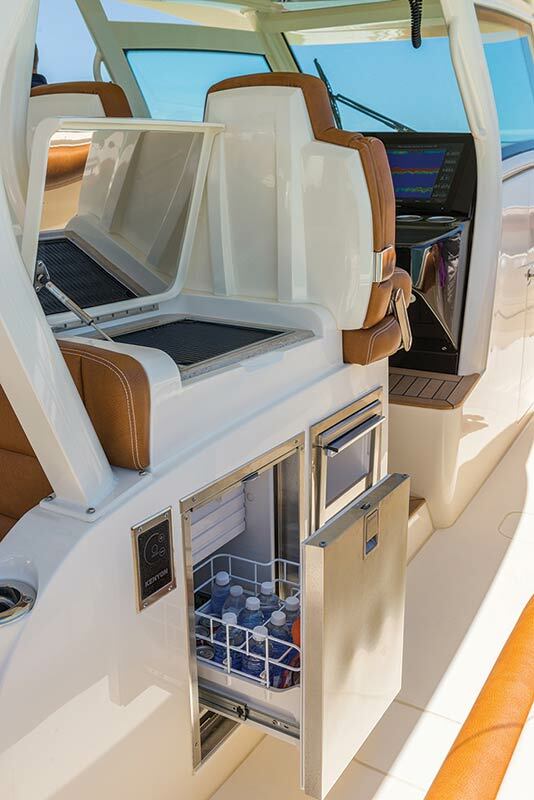 Access to the Eco-Teak swim platform on the transom is via a starboardside walk-through door designed to eliminate the splash well and allow docking the boat on either side but still permit easy walk-through access from the transom door. 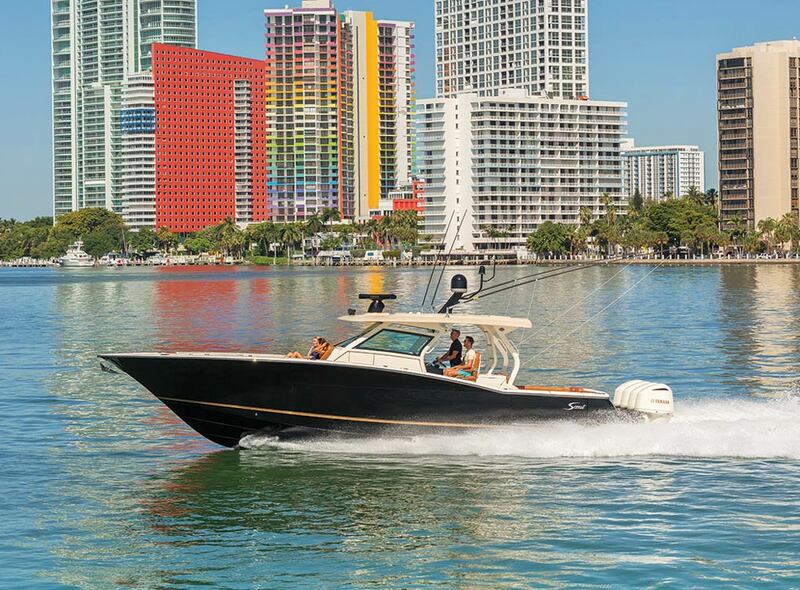 Servicing the main systems on the 420 LXF is made easy with the help of a midship systems room and a stern-accessible room. 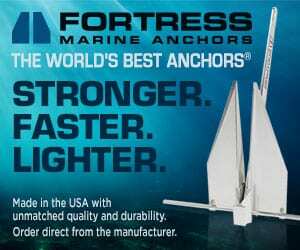 These areas feature impeccable rigging, and the optional Seakeeper 5 stabilizing system provides at-rest stabilization reducing the roll 70 to 90 percent and has a small footprint of 30 x 30 inches. Anglers will appreciate the eight flush-mounted rod holders, aerated transom baitwell, and port and starboard floor fish boxes with overboard diaphragm discharge. 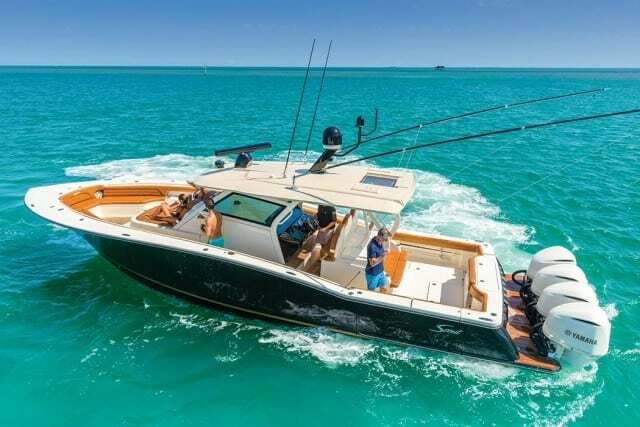 Outriggers on the hardtop are ready to be deployed for trolling, and there are also hidden fresh and raw water hose-reels built into the hardtop. When moving into the bow area to fight a fish, there’s plenty of room to maneuver—the teak bow table can be lowered from its raised position and dropped flush into the floor. “The bow has amenities everywhere—the teak table, USB charging ports, facing lounges along the gunwales,” Lawton said. “There are stereo controls and cup holders along with storage compartments that are completely finished off. 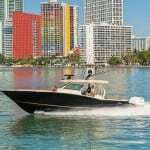 That finishing on places you don’t normally see is an attention to detail that we do all the way down to our 14-foot boats.” One super cool place to ride is on dual lounge seats in front of the center console pod, which feature armrests, cupholders and are big enough for full leg extension. The air-conditioned cabin—accessed through a portside entry door—has excellent headroom and a king-sized bed. LED reading lights, a 32-inch flat-screen TV, DVD player, and well-appointed galley with a Kenyon two-burner stove, microwave and drawer refrigerator make the 420 LXF perfect for overnighting. 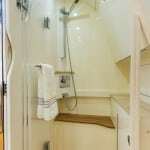 The head area offers generous room, and the shower area can be closed off. 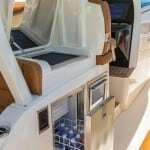 The cabin bulkhead also offers excellent access to the electronic rigging at the dash. The DC panel and controls for the 12,000-BTU air conditioning and Kohler generator are also in the cabin. 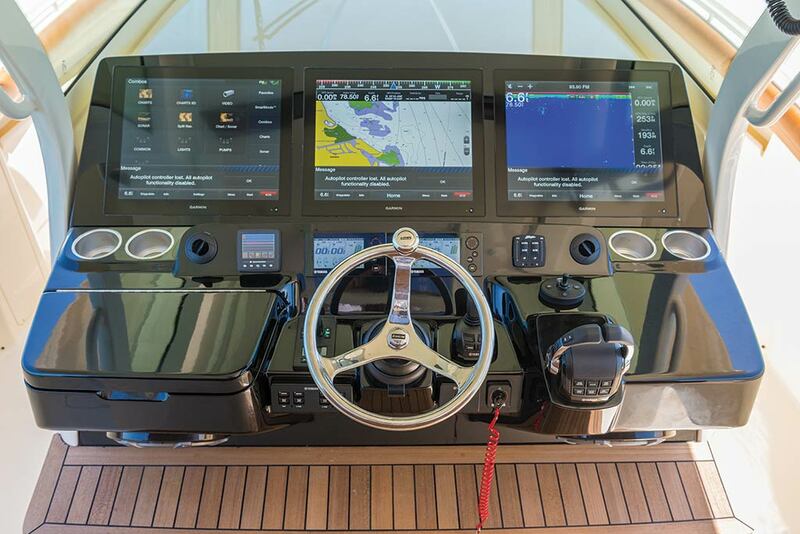 Yamaha’s Helm Master steering system is a must with four big Yamaha engines on the 420 LXF. Powerful computers adjust each engine’s rpm, gear selection and direction precisely so those forces result in the movement the captain commands with the joystick. 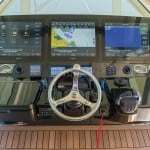 Other electronic features include C-Zone digital switching, a Fusion stereo with Bluetooth control, Ritchie magnetic compass, and Garmin Wi-Fi router. 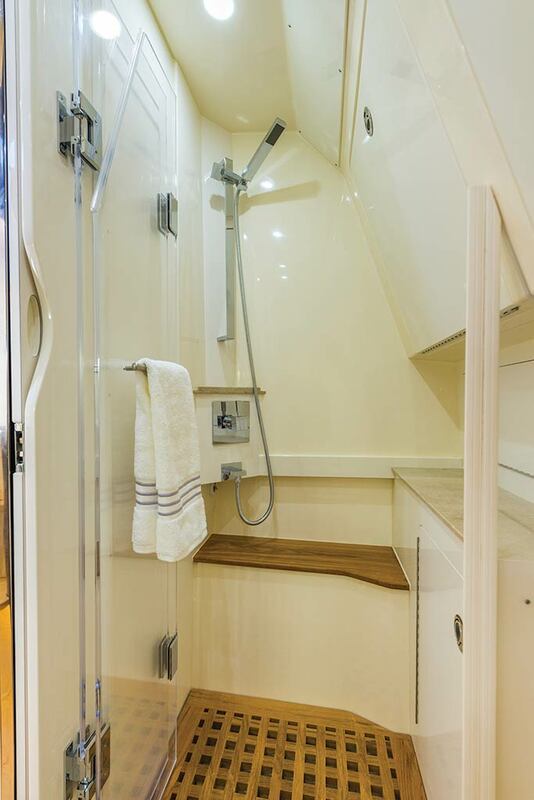 There are a host of optional upgrades available, including custom painted engines and a SureShade integrated retractable awning. 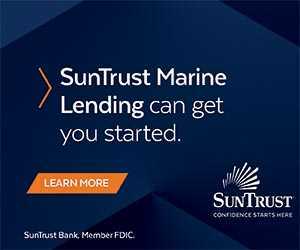 To light up the water or simply see what’s around the boat, optional underwater deck and bow cameras are available as well as underwater LED lights. Customers have a choice of two colors with the plush Brisa upholstery, and in the cockpit there’s room for a table or fighting chair alongside an optional electric grill. Displacement (dry weight with 4x engines): 19,000 lbs.